Jaguar has taken the covers off the new look XF, and it promises to be the most efficient Jaguar yet, with economy of over 50mpg and CO2 emissions of 149g/km. It goes on sale in September, with prices starting at £30,950 for the entry level 2.2-litre diesel. The new XF takes a lot of its styling from the bigger XJ model, with a new look front end featuring slimmer headlights and LED strips. The grille is more upright, and the ‘power bulge’ more pronounced. A new bumper finishes the new front end design off. Redesigned LED taillights and a new Jaguar logo bring the rear of the car up to date. The interior has been reworked too, with revised switchgear and a redesigned steering wheel, as well as all new centre console and dial mounted screens displaying information from the reprogrammed infotainment system. Seats have been redesigned to offer more support, and new trim finishes complete the updated cabin. There have also been changes beneath the skin, with a new 2.2-litre four cylinder diesel available for the first time. This new unit produces 190PS and an impressive 450Nm of torque. It’s linked to an eight-speed ZF automatic gearbox, and is fitted with a stop/start system, reducing fuel consumption and CO2 emissions to more than 50mpg and 149g/km. The current 3.0 V6 diesel and V8 petrol engines will continue to be available, with the Diesel S model taking on many of the styling features from the high-performance range-topping XFR. Across the new XF range changes have been made to help improve refinement. Active engine mounts are used with the diesel engines, and a new sound deadening material has been used to reduce engine noise, and new wing mirrors reduce wind noise. 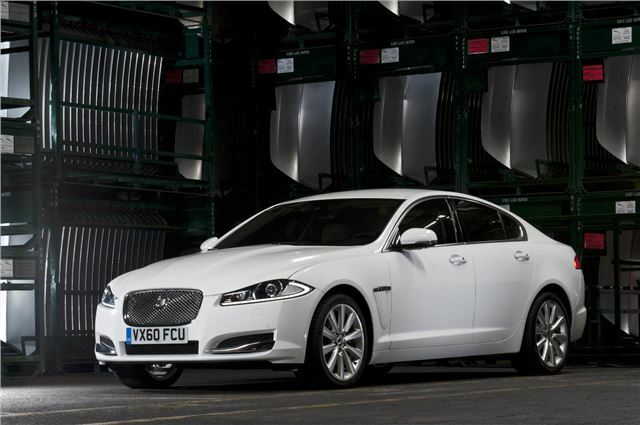 The new XF will go on sale in September 2011, with prices ranging from £30,950 to £65,350 for the XFR. Jaguar has also released details of the 2012 XK, which will take on styling similar to that of the XKR-S first shown at the Geneva Motor Show 2011. The new model will feature slimmer headlamps, a larger grille, and redesigned LED taillights along with a host of smaller styling tweaks and optional new sports seats trimmed in leather.